LAPD’s Troy Williams speaks to Transportation Committee yesterday. Photo: Joe Linton/Streetsblog L.A.
Over the course of the next two years, the city of Los Angeles plans to increase speed limits on many of its major streets. Why? According to the Police (LAPD) and Transportation (LADOT) Departments and due to pernicious state laws, cities are required to frequently study and increase speed limits to be able to actually ticket drivers who speed. At the root of the problem is state “speed trap” law, which prevents cities from setting “arbitrarily low” speed limits. This law is defended by the California Highway Patrol and AAA. California requires local municipalities to periodically conduct speed studies and then to set speed limits based on how fast most drivers are already going. Cities are required to make the speed limit match the 85th percentile of prevailing traffic. Changes worsened the law in 2009 by taking away a modicum of local discretion to set slightly lower speed limits. Combined with traffic engineering standards that favor auto speeds, this law results in a vicious cycle that favors faster and faster speeds. Speeders speed. City studies count speeders. Studies result in increases speed limits. This enables speeders to speed even more. The state requires Los Angeles to conduct a speed study every seven to ten years. If speed surveys are not done, or if they expire, then LAPD cannot use state of the art laser speed enforcement devices. 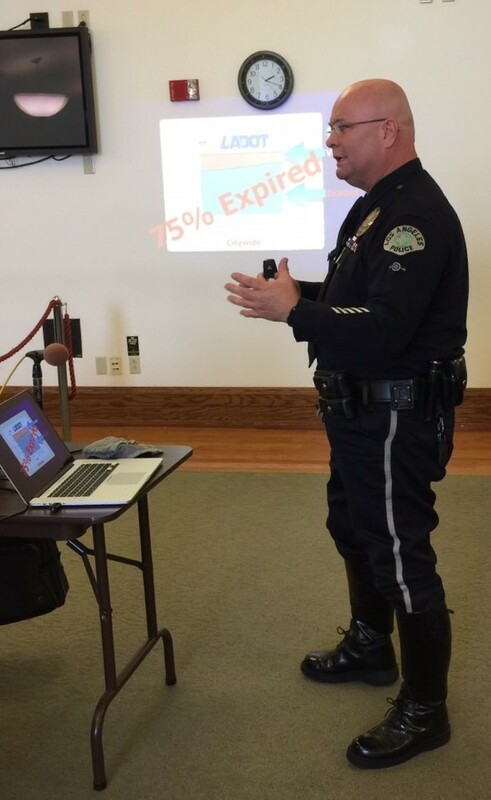 At yesterday’s Los Angeles City Council Transportation Committee, LAPD officer Troy Williams bemoaned the state of speed enforcement in Los Angeles. Per Williams, as of late last year, 75 percent of L.A. streets had expired speed surveys, meaning that LAPD’s “hands are tied” and speed limits are not enforced. The figure is over 80 percent on the city’s targeted Vision Zero High Injury Network: 6 percent of L.A. streets where 65 percent of all deaths and severe injuries take place. In short, L.A.’s deadliest streets are largely places where LAPD cannot enforce speed laws. Williams stated that in 2010, LAPD issued 99,000 speeding tickets and, in 2015, that number had dropped to 16,000. According to Williams, a great deal of LAPD laser speed enforcement equipment sits on LAPD shelves as officers have turned them in due to lack of use. Though speeding is enforced by LAPD, speed studies are done by LADOT, with revised (read: increased) speed limits approved by City Council. In the past, livability advocates have frequently vehemently opposed approval of increased speed limits. Due to budget shortages, LADOT has been unable to keep speed studies current. In July, the new city budget restores funding for LADOT speed studies. LADOT Senior Transportation Engineer, Nader Asmar pledged to Transportation Committee Chair Mike Bonin that, under current budget levels, LADOT would complete speed studies for 100 percent of the High Injury Network in two to three years. Even livability champion LADOT General Manager Seleta Reynolds stressed that speed surveys and resultant speed limit increases are needed. Though it is counter-intuitive, these increases for will allow LAPD to resume enforcing speeding laws. That enforcement, combined with engineering design for lower speeds, should make L.A. streets safer. Reynolds urged the councilmembers to work with their constituents to support upcoming speed increases. Ultimately Bonin, Reynolds, and LAPD representatives blamed state law for the city’s current speeding dilemmas. Hopefully as the city and LADOT set their state legislative agenda, they can work to undo the deadly state laws. The speeding enforcement motion (15-1006) will remain in the Transportation and Public Safety Committees. Bonin directed LADOT and LAPD to return at a later date to report on the status of enforcement and engineering work to prevent speeding. Page 189 of the City of Los Angeles 2015-16 fiscal year budget has the Bureau of Street Services Budget and at the end of page 193 is the Department of Transportation Measure R funds from the 5% local return set aside for pedestrian and 5% for bicycle capital improvements. A 5% share of the 15% local return is 0.75% of the total Measure R half-cent sales tax funds allocated for the city of Los Angeles out of the total amount for the whole county. I hope, after the two year process is complete, the results of these speed surveys are made public. It would be valuable to know exactly where speed limits have changed, and how that has affected crash rates. “Smooth and safe flow of traffic” is a euphemism for designing the rods for cars only and ignoring the safety of anyone else. It’s a problem because “the speed most drivers are comfortable at” frequently makes an area hostile to pedestrians. Your statement makes no sense. If you ignore the safety of others you don’t get smooth and safe flow of traffic. Any type of accident will not help traffic. So preventing ALL accidents is factored into road design. That makes no sense. In the city pedestrians and cars do not share the road at the same time. If a pedestrian is on the sidewalk, why does the speed of the car on the roadway make them less safe? Please explain that statement. Pedestrians are not always on the sidewalk. In some places there are no sidewalks (yes, even along busy arterials), or the sidewalk is unusable (for example, covered with snow). In those cases, pedestrians will frequently be using the street at the same time as cars. In addition, pedestrians cross intersections. But cars that travel at a speed that is incompatible with safe pedestrian access will not always bother to stop before the crosswalk, and if there is no traffic light light, only stop or yield signs, then they might not always bother to come to a stop for pedestrians at all. One more point. The roads and traffic signals need to be properly engineered. Proper engineering influences driver behavior and will make for safer roads. Improper engineering, like using speed humps and short yellows necessary to make traffic cameras economically feasible, have the opposite effect that ignorant people think they will have. Speed humps cause drivers to race between them and short yellows increase rear end accidents and red light running. But those short yellows put a lot of money in the cities coffers as well as those of crooked camera companies, look up redflex and Ohio. Where did that 20-25MPH number come from? At least the number being used are based on facts, not on guesses. You need to get the city to add sidewalks. If pedestrian traffic is heavy in areas with no sidewalks, you can and should lower the speed limit till the city does it’s job and puts in sidewalks. A proper traffic survey in that area would show lower car speeds as cars do slow down when pedestrians are on the road. If there is snow on the sidewalk, then you need to fine the home or business that did not clear the snow as required by law. I would also question the judgement of the pedestrian who thinks walking out on a snow covered road is a safe alternative to walking on a snow covered sidewalk. Intersections are a problem. No argument there. What you describe is poor road engineering. If there is that much pedestrian traffic at an intersection then a traffic signal is needed, not just a painted crosswalk. But that costs money. Politicians have sold the ignorant on using cameras as a solution, when they are not and do nothing for safety. But cameras make lots of money even if they don’t help with safety. But the money is too tempting for politicians to pass up. That is why they put up cameras instead of properly engineering intersections that have heavy pedestrian traffic. What needs to be done, but is being ignored is that pedestrians need to be given time to cross the street while cars stopped in all directions. Then turning cars will not turn into pedestrians crossing the street. Lastly, thee are some problem drivers out there that need to lose their licenses. But again the current solution being pushed, cameras, will not cause drivers to lose their license. You need cops enforcing the laws and giving out tickets with points that will cause drivers to change their habits or lose their license. The number of drivers that fall into this category is a tiny percentage of all drivers, but when you have a large number of drivers that tiny percentage can be a large number. But any smart person would see that you don’t set laws for the tiny percentage of drivers. You get rid of those drivers by proper enforcement by police officers. My answer is to say “Don’t walk in the street! Idiot.” I don’t care if there is or isn’t a sidewalk. Walk on the grass. I always did, besides, where I live anyway, walking in the street is considered jay-walking, and is ticketable. Doesn’t matter if there’s a sidewalk there or not. There has to be absolutely NOWHERE else to walk, and even then, you’ll be told to find a different way next time. Snow? Trudge through it. I did it. You can too. On a public road, it is. Slower is NOT safer. Speed does NOT kill. Poor engineering, corrupt laws that put revenue above proven safety, and corrupt police and courts, kill. I don’t care if there is or isn’t a sidewalk. Walk on the grass…. Snow? Trudge through it. I did it. You can too. Should I pass your message along to the people who had to drive their Amigos on the road because the city wouldn’t clear the sidewalk in a timely manner last winter? would also question the judgement of the pedestrian who thinks walking out on a snow covered road is a safe alternative to walking on a snow covered sidewalk. Um, who says the road is still snow-covered? There are both traffic signals and visible painted crosswalks at some of the intersections I have in mind. No matter – motorists still don’t bother to check for pedestrians. That’s not an engineering issue. That’s a problem with a culture of entitlement for motorists. Not at all. The number of drivers who have some of the dangerous habits I talked about (like not bothering to check for pedestrians) is quite large. On your second paragraph, crossing a street is not even close to the same thing as walking or riding a bike in the street. This topic is about walking or riding a bicycle in the street, and “bike lanes”. i took a quick scan of the web site and I see nothing to indicate any studies were done to come up with that number. The only message that stood out is that they are doing it to discourage the use of cars. That isn’t a really good reason as it hurts those that have no choice and have to use their cars. Sorry to say, you are wrong. Roads, with some exceptions, are made for use by all. If there are sidewalks, they pedestrians should use the sidewalk. But if there are none, they have the right to use the road just like vehicles do. You should check your local laws. Funny how you label safe and reasonable speeds as “speeding” . The cars are traveling at speeds that the road design can easily handle are not speeders. It is stupid to think that suddenly changing the speed limit to a number that is not backed up by data will change driver behavior. Drivers are not stupid and will see right through what that is, a way to make more money by giving out tickets. With that said there are design changes that can, and should, be made to make the streets safer for all users. I wonder why those are not done first. Lowering a reasonable speed limit should be the last resort, not the first. An then only if there is data to back up the change. Too often what ignorant entitled folks want is for pedestrians to not be held accountable for their actions. In most accidents involving cars and pedestrians the pedestrian is partially responsible for the accident. If there is a lot of pedestrian traffic at an intersection, there should be no right on red for cars. Pedestrians should get time to cross the street before cars are allowed to turn. Turning cars failing to yield to pedestrians is one of the deadliest accidents and that is the one thing that should be addressed first and is usually not. The studies I mentioned are based on years of data. The others are based on speculation. Basically they want to experiment on the public to prove their theories. They also have the mentality that automobiles are all bad and are the root cause of all problems and that pedestrians, cyclists and cars can’t really coexist the way they do now. It’s basically dumbing down to the lowest common denominator. That only insults the ones that are not down at that level. There are changes and compromises to be made, but they don’t need to be as drastic as what is being proposed. Safest using what metric? Fatalities per VMT? That’s a nice theory. But here in the real world, lots of people consider scaring pedestrians and bicyclists away from a street, rather than ensuring safe access to using the street, the ideal way of reducing accidents involving pedestrians or bicyclists. Many years of data by trained professionals prove this to be correct. This isn’t some grad students theory being foisted on the public. No one is trying to scare pedestrians and cyclists away from the road. I guarantee you I bike more than you do and I am not scared off by cars on the street. I’ve taken the time and effort to learn how to bike on the street safely with cars. Cars, unlike pedestrians, are much more predictable. Being predictable is what makes it possible to share the road safely. Look at the accident data. In more than 1/2 of all car/ped accidents the pedestrian contributed to the accident. The data clearly shows pedestrians are at least as much responsible as cars in these accidents, why is no one trying to get pedestrians to act more responsibly? Why is it that you are trying to place all the responsibility and blame on cars? You misread what they meant, not that I agree with it. What they are saying is to redesign the streets to make cars go slower. That means they want to make the streets narrower and add obstacles. Then they want the new lower speed limited enforced, which makes no sense. These are the stupid ideas you get when ignorant folks try to design streets. A road with properly set speed limits needs very little enforcement because cars will naturally travel at or below the limit. Some folks think all drivers are lunatics out to kill anything that gets in their way. “The data clearly shows pedestrians are at least as much responsible as cars in these accidents” This isn’t data that I am aware of – seems like driver speeding (and other illegal behavior) is responsible for the lion’s share of carnage. Because cars kill. Peds and bikes don’t. Strict liability etc. Google ‘crash survivability rates’. It will open your eyes to the true cost of speed. If you slow down the cars you will have fewer casualties – regardless of who is at fault. This can be done through design and by enforcement. Streets are designed for level of service – moving cars as quickly as possible. Safety has never been the number one priority. Things are changing not because the DOT wants them to but because they are being shown data that proves speed kills and that LOS design encourages dangerous motorist behavior and dissuades more benign modes of travel. Cars, unlike pedestrians, are much more predictable. I can’t predict whether a driver will look before making a turn. I can’t predict whether a driver will stop to look at their cell phone or the fussy kid in the back seat, rather than driving. I can’t predict whether they will actually stop before the crosswalk or will block it to wait out the red light. No one is trying to scare pedestrians and cyclists away from the road. Read any news article about a car/bike or car/pedestrian crash, and read the comments section. Lots of those “no ones” will show up. Sometimes those “no ones” aren’t just random joes, either. They can be newspaper columnists (e.g. Jeff Jacoby of the Boston Globe) or politicians as well. Wait, what data? You haven’t produced a single citation, or explained how these results were determined. I bike at least an hour or two every day. If you bike more than that, I’d be impressed. Where do you find the time? Why is it that you are trying to place all the responsibility and blame on cars? I don’t blame cars (unless they have a manufacturing defect). I blame drivers, for the most part. I’ve seen several cases where police conduct a perfunctory investigation, blame the ped, and then video or eyewitness testimony turns up to show that the driver was acting irresponsibly. Can you be specific? What research are you talking about? First, you’re trying to attribute an argument (“slap up slower speed limits signs”) to me which i never made – which is a dishonest debate tactic. Second, you’ve staked out a morally reprehensible “slow the cars down as last resort” position. Both of these points lead me to believe you suffer from an acute lack of moral or ethical boundaries and/or are blinded by some internal sense of the primacy of the private motor car in every urban planning and transportation decision. Fingers crossed that you’re not actually working in a local transportation agency as you are the personification of bureaucratic evil. I didn’t say predict if they will look before turning. No way to do that. You can tell when most cars are going to turn. You can usually tell if a car is going to stop at a red light. As a person sharing the road you too have responsibility to pay attention to what is going on around you. Stepping off the curb without looking is asking for trouble. You are right Jeff jacoby is an idiot. You are right, it’s not nobody. I should have said few. I have to look up that study that shows peds being contributing to the accident in more than 1/2 car/ped crashes. It was posted in streetsblog.org, that’s how I found it. I also took the time to read it. I bike to and from work every day. I put in a little over 2 hours every day, rain or shine. I also put in a few more hours doing fun rides on weekends. I spend most of that time in traffic. I’ve taken the time and effort to learn to do that safely. I’ve had more issues with pedestrians than with cars. Parents should take the time to teach their kids the rules of the road and how to act predictably on the road. That is the only way you can safely share the road. I am currently doing that with my son. It’s is foolish for a parent to through their child out on the roads with no instructions. You can’t expect other people to take of your kids for you. You have to take responsibility for your actions. Ok. let me re-state that. Why are are putting all the blame on drivers? Pedestrians share the blame too. You should be targeting both with any safety campaign. Right now everything I see is pointing fingers are drivers. All actions are to make it harder to get around with your car? Police can be biased and blame pedestrians when it is not their fault. Police are usually not witnesses, so they can only go on information other’s give them. Video and eye witness accounts after the accident go both ways. sometimes it puts blame on the driver, sometimes on the pedestrian. Help yourself. The web is your friend. Look at 85th percentile speeds. Look at the MUTCD. Look at the recommendations on setting speed limits. Those recommendations are based on past, and current, studies on how to best set speed limits. similarly 0 is best, but unrealistic. Stepping off the curb without looking is asking for trouble. Parents should take the time to teach their kids the rules of the road and how to act predictably on the road. True, but not always relevant, especially if you’re dealing with drivers who aren’t paying attention to what they’re doing. I bike to and from work every day. I put in a little over 2 hours every day, rain or shine. Nice. Okay, you’ve got me beat. You can’t expect other people to take of your kids for you. Asking drivers to watch where they’re going is not exactly too much to expect. I’ve had more issues with pedestrians than with cars. I can get annoyed with pedestrians, too – the ones who aren’t paying attention to anyone coming up behind them, the ones who spread out several abreast across a mixed-use path and stroll casually along, preventing any bikers, joggers, et cetera, from passing them, and other types. But when I have issues with pedestrians, it’s a minor annoyance. It’s not someone operating heavy machinery who could land me in the hospital or morgue if they aren’t paying attention to what they’re doing. I would never do that. The stupid interface must have made a mistake when I replied to a comment. Morally reprehensible? Not sure how you reached that conclusion. Logically you find the answer that is least harmful to everyone and go with that. That is what I am suggesting. Primacy of the motor vehicle? You are the typical person who does not understand traffic and how you share a limited resource. You think that all traffic needs to account for selfish pedestrians who think they can do whatever they want whenever they want. I am a pedestrian, cyclist and driver. I view the problem from all three points of view and come to a conclusion as to which solution works well for all three. You are trying to propose a solution that only accounts for pedestrians and a very limited number of cyclists who can’t be bothered to learn how to ride on the road.